The present recording presents two of "Papa" Haydn's great late symphonies together with a rarity. Symphony No. 89 was composed during the interim following Haydn's triumphant tour in Paris and just prior to his conquest of London in 1791. The work reflects the influence of his young friend, Wolfgang Amadeus Mozart, and is one of the rare examples of Haydn borrowing from himself; in this case, the second and fourth movements were repurposed from a Concerto for two Lire Organizzata. Symphony No. 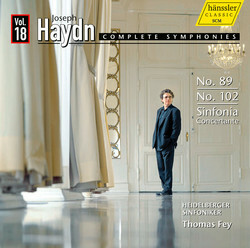 102 is from the set of 12 masterworks that have come down to us as the "London" Symphonies. This symphony also includes a reworking of a previously written piece (the second movement is an orchestration of the second movement of the F sharp Minor piano trio). Our rarity is the Sinfonia Concertante in B flat Major, composed at the request of his friend, the English impresario Johann Peter Salomon - no doubt as a special treat for the London audiences who flocked to hear Haydn.